Vancouver's most important map. 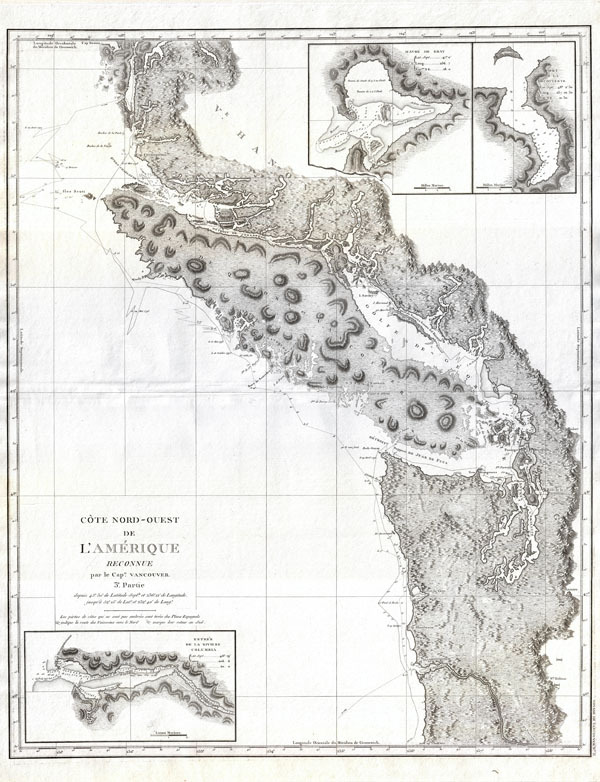 The first map to show Vancouver Island and the Puget Sound. Cote Nord-Ouest de L'Amerique Reconnue par le Cape. Vanouver. 3e. Partie. Considered to be the great navigator George Vancouver's most important and influential map, this is the third plate of his reconnaissance of the northwest coast of America. This 1799 map covers from Cape Lookout (modern day Oregon) northwards past the Columbia River, the Strait of Juan de Fuca, Vancouver Island, Queen Charlotte Sound, to Cape Swaine (Alaska). This beautifully engraved map features a number of notable firsts, including the first published map of the Puget Sound, the first mapping of Vancouver as an Island, and the first mapping of the Johnston Strait. Mount Rainier, Mt. St. Helene, Mount Baker are all noted. Inset maps in the upper right quadrant detail Cape Gray (Havre de Gray) and Port Discovery )Port de la Devouverte). Another inset in the lower left quadrant focuses on the mouth of the Columbia River, soon to become a major artery for the fur trade. This particular example of Vancouver's map was issued as plate no. 6 in the highly desirable 1799 French edition of Vancouver's Atlas. The rare and coveted French edition of Vancouver's Atlas is more beautifully produced with better engraving, higher quality paper, and more detail then the 1798 English edition. This scarce map is a core piece for any serious collection focusing on Vancouver, British Columbia, or the Pacific Northwest. Storm, C., A Catalogue of the Everett D. Graff Collection of Western Americana, 4456. Howes, W., U.S.iana (1650-1950: A Selective Bibliography in which are Described 11,620 Uncommon and Significant Books Relating to the Continental Portion of the United States, V23. Sabin, J., Biblioteca Americana. A Dictionary of Books Relating to America, from its Discovery to Present TIme, (29 vols) 98443. Wagner, H. R., The Cartography of the Northwest Coast of America to the Year 1800 (2 vols), 853-860. Rumsey 3354.005 (English Edition),0233.007 (1828 edition). Falk, M. W., Alaskan Maps: A Cartobibliography of Alaska to 1900, #1799-7; Hayes, D., Historical Atlas of the Pacific Northwest: Maps of Exploration and Discovery: British Columbia, Washington, Oregon, Alaska, Yukon, #148.